Stock No. S268, Price: $1,495.00. 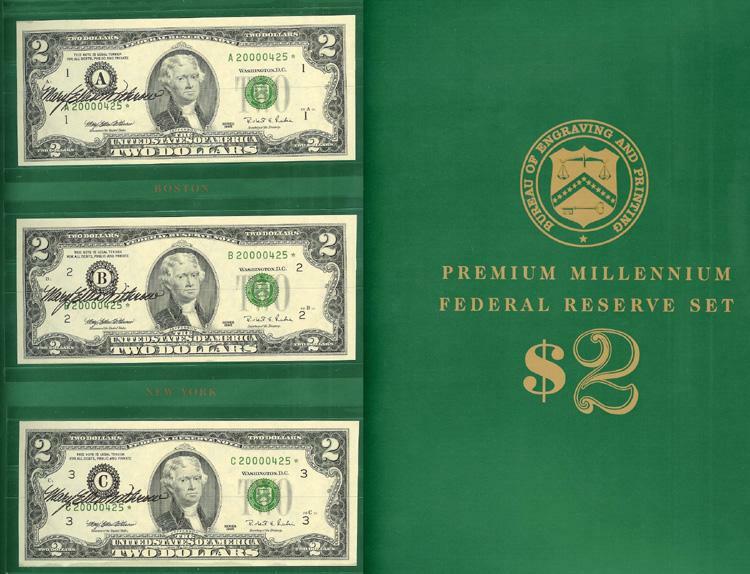 $2.00 STAR FEDERAL RESERVE NOTE SET, Series of 1995, MILLENNIUM SET, Serial No. A to L 20000425 STAR, UNCIRCULATED. Each note and the folder is AUTOGRAPHED by the Treasurer of the United States, Mary Ellen Withrow. Only 2,000 of these Millennium Sets were issued. The notes have the typical oil stains from the new cutting blades that was used by the BEP. There are 12 notes in this set, one from each of the 12 Federal Reserve Districts. Each note has a matched serial number 20000425, and each note is personally autographed. This is the only set we have handled that has each note autographed.